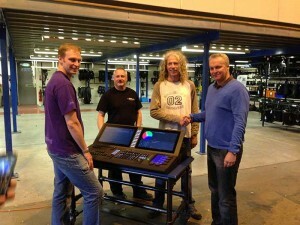 Stage Electrics have supplied the very first ETC EOS Ti lighting console in the UK to Birmingham Royal Ballet (BRB). BRB under the creative leadership of David Bintley have created a worldwide recognised name for themselves and are welcomed enthusiastically on tour around the world. The company has recently completed successful tours in China, Japan, USA, Hong Kong and South Africa. When the company decided it was time for an upgrade of all their lighting control systems they turned to technical theatre specialists Stage Electrics to find a solution. After evaluating a series of lighting consoles, they selected a family of ETC products, which provided a comprehensive, scalable package including the first EOS Ti in the UK. The new EOS Ti is elegant and uncommonly powerful and provides simple, approachable control in a nuanced programming environment, with unmatched depth and power. "ETC was the best choice for us. The EOS Ti is an exceptional product and definitely ticked off all the boxes for our requirements. It provides us flexibility to use as or main programming console whilst the other products are ideal for our many tours. We’re thoroughly enjoying using this ingeniously created product," commented Johnny Westall-Eyre, head of lighting at Birmingham Royal Ballet." As part of this sale a further two ETC Ion’s and one Gio plus remote processor unit and remote video interface were supplied to complement the EOS Ti; all will be used within The Birmingham Hippodrome Theatre and for touring. The EOS Ti lighting console was used for the first time in September at The Lowry for Peter Wright's ‘The Sleeping Beauty’. In picture: BRB’s deputy head of lighting Andy Wilson, senior lighting technician Chris Hooley and head of lighting Johnny Eyre with Paul Lucas, business development manager, Stage Electrics.